In the ruined resort town of Tskaltubo, the Soviet-era hotels were once graceful monuments to the promises of socialism. But they now house a new generation of guests, ones who don't want to be here. Akobidze is one of more than 6,000 internally displaced persons (IDPs) living in Tskaltubo. 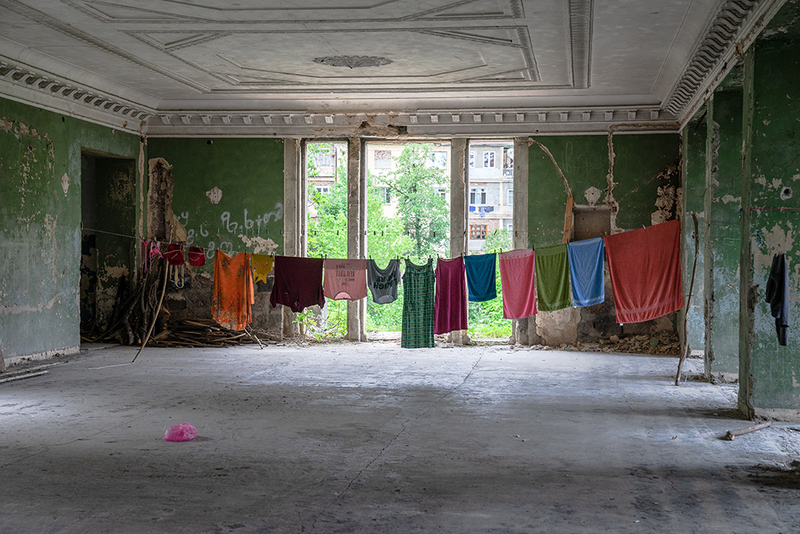 A quarter century after the conflict, they remain poorly integrated in Georgian society, reduced to a life of squatting in the Soviet Union's once-magisterial hotels and living off the land. 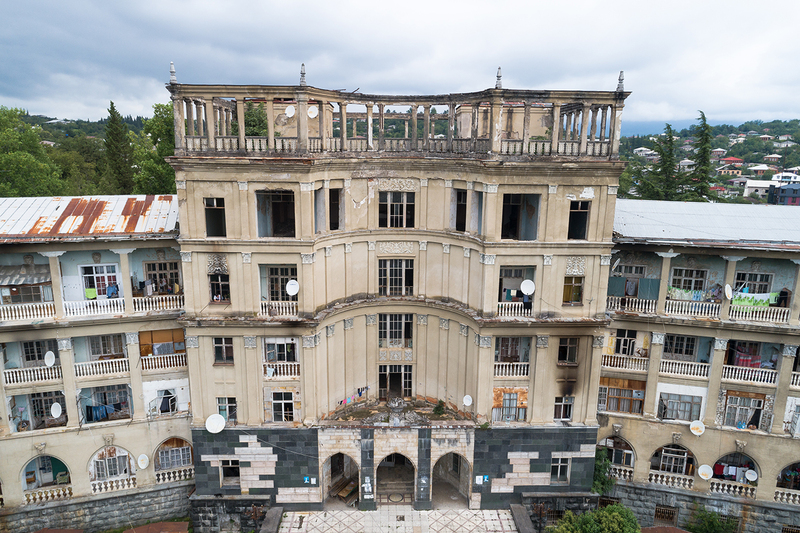 Tskaltubo residents who guided Eurasianet through the damp, dimly lit corridors of their homes in the Sanatorium Tbilisi and the Railwayman Sanatorium pointed out the collapsing ceilings and floors, which they described as a constant safety threat. Some hallways have a foul smell because of the makeshift, leaky sewage system built in the corridors using a complex network of plastic pipes. In its prime, Soviet citizens once flocked to hotels like these as part of state-funded “putevki” programs, requiring workers to take spa vacations each year. But the bathhouses and tropical gardens that vacationers once enjoyed are long gone, replaced by vegetable plots that the new residents need to survive. IDPs get a monthly 45 lari ($18) benefit from the government, and retirees – who comprise the majority of the hotel’s guests – receive the standard Georgian pension of 180 lari ($73). Nata Gogoberishvili, 83, described in agonizing detail how Abkhazian insurgents shot her in the spine and killed her husband during the war. She said her pension should be 1000 lari per month ($408) because her husband died in the war. But she said the government has repeatedly told her that the cause of his death is yet to be determined and so she receives the standard 180 lari pension. Adding insult to injury, the hotels have lately attracted a new clientele – foreign tourists who see something photogenic in the fading grandeur of Soviet ruins. This tourism economy – much vaunted by Georgian officials – provides little benefit to the country’s most marginalized citizens, they complain. Abshilava was the first child to be born in the Sanatorium Tbilisi. He studied history in nearby Kutaisi and dreams of working in a library or a museum but says there are few opportunities in Tskaltubo. “Now I just play online poker to earn some extra money,” he said. Sanatorium Tbilisi from the outside. Abshilava’s situation is not uncommon. 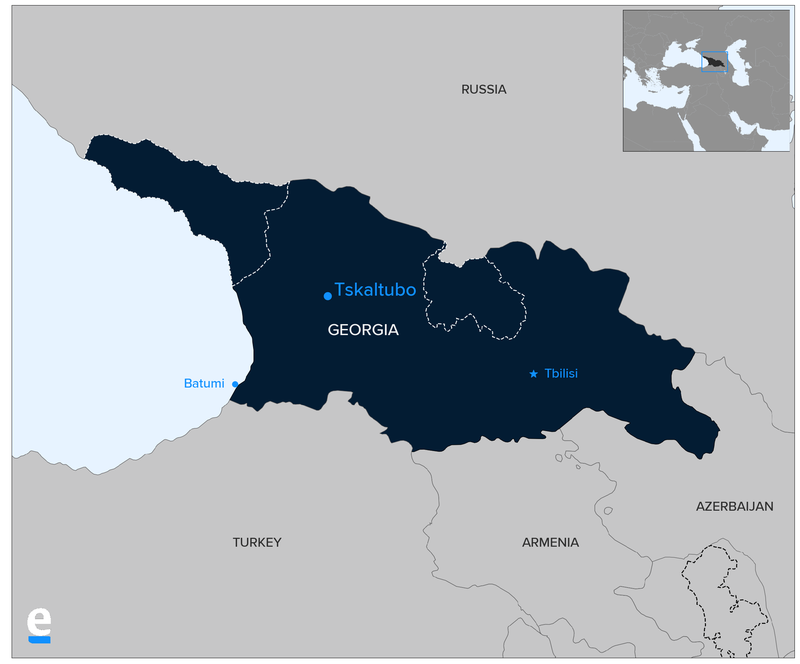 There are more than 250,000 people in Georgia displaced from Abkhazia and South Ossetia, another erstwhile Georgian territory that also broke away from Tbilisi's control after the Soviet Union collapsed. In 2013, the United Nations Development Program reported that 45 percent of Georgia's IDPs live in poverty. In Abshilava’s case, four generations of his family live in two bedrooms. His bedroom, he said proudly, was once used by former Georgian President Eduard Shevardnadze during a visit to the resort town in the 1980s. Power cuts and water shortages are also common as residents struggle to pay their bills. To earn money for his family, Abshilava, like many young men, works on construction sites, but the work is seasonal and unreliable. Tskaltubo has undergone a makeover in recent years, with a new 78-hectare central park, tennis courts and a new generation of glitzy hotels like the Tskaltubo Plaza. Town planners are hoping to make use of nearby Kutaisi’s newfound role as a hub for people flying between Georgia and Europe. Investments in the town will revive its former image, bringing new opportunities for the community, Salome Kutabeladze, the director of the regional Tourism Development Center, told Eurasianet. Kutabeladze said that increasing numbers of tourists will bring investments to Tskaltubo, some of which will help reintegrate IDPs into Georgian society. That building stands on the outskirts of town, fenced off as it undergoes renovation. But Tskaltubo’s remaining IDPs are skeptical of government promises. According to the ruling Georgian Dream party’s pre-election program, about 12,000 IDPs are to be given accommodation from 2017 to 2020. But thus far it has been falling consistently short of the 3,000 relocations per year that figure would require, according to data compiled by factcheck.ge, a local investigative news site: In 2013 a total of 1,772 IDPs were given new accommodation; in 2014 the figure was 1,493; in 2015 it was 2,739; and in 2016 it was 2,141. Georgia's Ministry of Internally Displaced Persons from the Occupied Territories, Accommodation and Refugees did not respond to a request for comment. Bradley Jardine is a freelance journalist who covers the Caucasus. Ryan McCarrel is a photographer based in Tbilisi.